...so I finally got to buy the things I was supposed to buy yesterday including a nurse's watch. 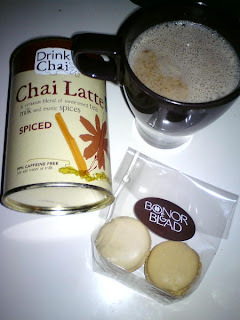 Also visited the specialty coffee and tea shop --- appropriately named Bönor&Blad (Beans&Leaves) --- to see if they sold chai latte powder, which they do and macarons too! These are the real deal and I plan to return tomorrow to try the other flavors. * Today was kinda blah, lots of waiting around. * I discovered that there's a bus route to the clinic that takes about as long as the tram ride, but is so much less crowded. * My name plate finally arrived in the mail.